Sigiriya is an ancient palace located in the central Matale District near the town of Dambulla in the Central Province, Sri Lanka. The name refers to a site of historical and archaeological significance that is dominated by a massive column of rock nearly 200 metres (660 ft) high. 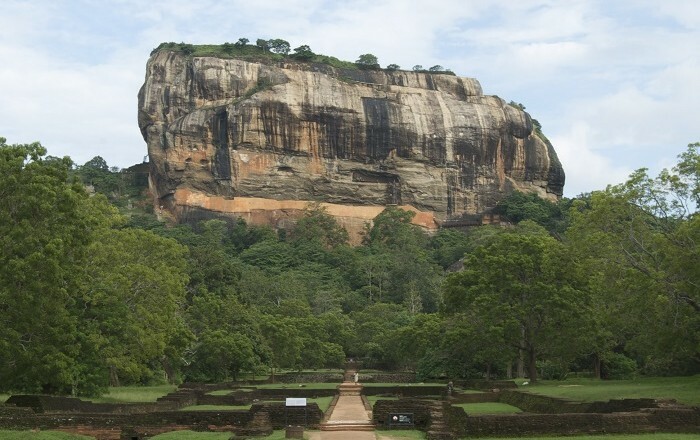 The story of Sigiriya is the tale of King Kasyapa who ruled between 477 and 495AD. A troubled but visionary king; Kasyapa murdered his father by plastering him up in a wall. Rejected by his people for his crime and tormented by guilt he abandoned his magnificent capital of Anuradhapura and fled deep in the forests of central Sri Lanka. There in an area dominated by a menacing black column of rock he built himself a new capital resplendent with lush gardens, palaces and pavilions. He transformed the sinister-looking black rock to appear like a huge dazzling white cloud and painted it with beautiful frescoes of semi-naked nymphs. He also built a massive gatehouse in the form of a lion to guard the entrance to the inmost sanctum of his city; the Sky Palace on top of the rock. Hidden from view and surrounded by his courtiers and harem, Kasyapa lived in splendid isolation. He was, however, deeply troubled by his responsibility for the death of his father. He carried out many good works and observed his religious duties diligently hoping, no doubt, to find some salvation for his troubled conscience. Finally, betrayed, by those he trusted, he committed suicide. The site chosen for the capital was a foreboding place indeed; teeming with wild elephants, poisonous snakes, leopards, bears, mosquitoes, hornets and other vermin. Kasyapa was fortunate. He was the king of a extremely prosperous kingdom. He also had a huge workforce of highly skilled laborers and artisans to do his bidding. An army of over a hundred thousand men, thousands of bullocks and many hundreds of elephants toiled for years to build a magnificent new city in the forest. The pièce de résistance of the new city was the rock itself. It was the centerpiece of the entire city. Kasyapa and his architects built a royal citadel with ramparts and moats and lavish gardens, ponds and fountains around this looming black rock. 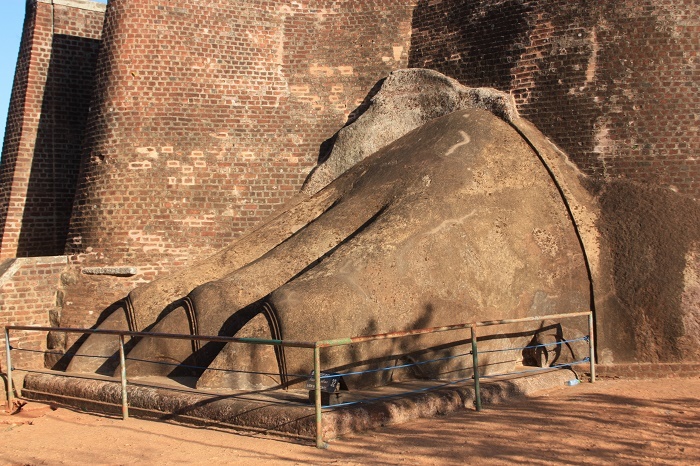 Upon Kasyapa’s death the royal capital was moved back to Anuradhapura. 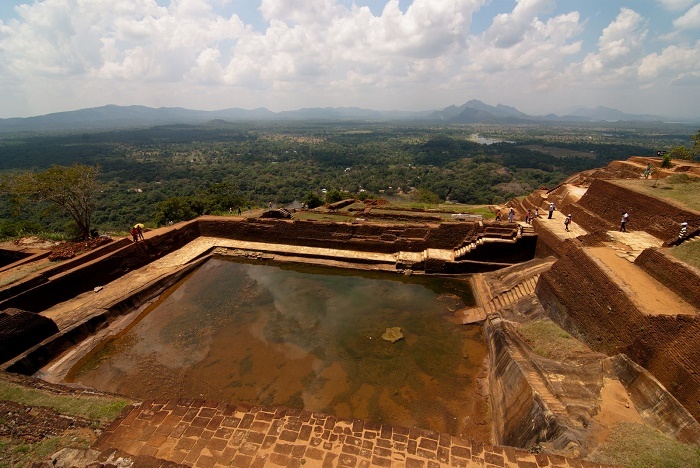 The magnificent Sigiriya Citadel was stripped of its treasures and converted in to a Buddhist monastery. Over the ensuring centuries it was progressively abandoned and then finally completely deserted. Slowly it was consumed by the forests and disappeared into the mists of time. 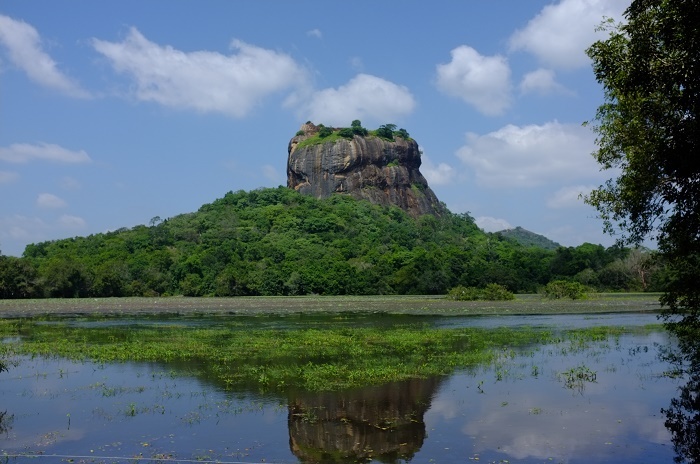 In 1831 Major Jonathan Forbes of the 78th Highlanders of the British army, while returning on horseback from a trip to Pollonnuruwa, encountered the “bush covered summit of Sigiriya”. 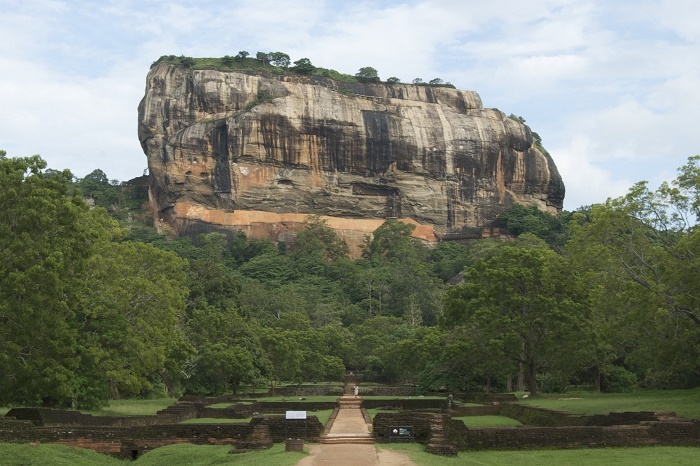 Sigiriya came to the attention of antiquarians and, later, archaeologists. 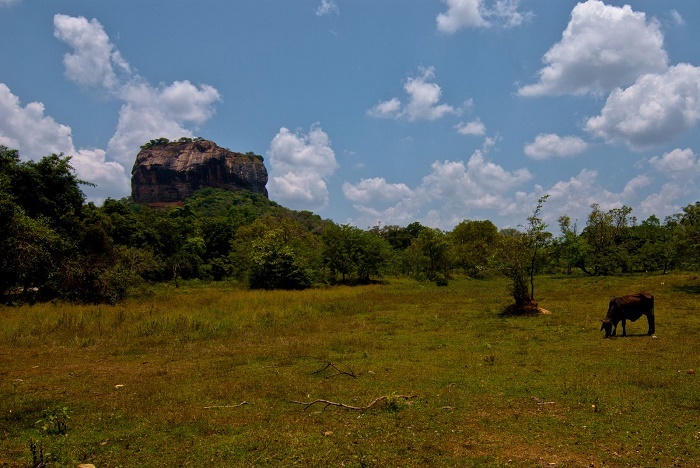 Archaeological work at Sigiriya began on a small scale in the 1890s. H.C.P. 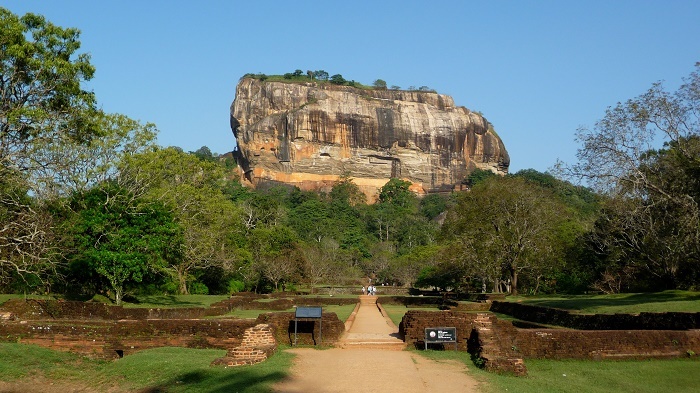 Bell was the first archaeologist to conduct extensive research on Sigiriya. 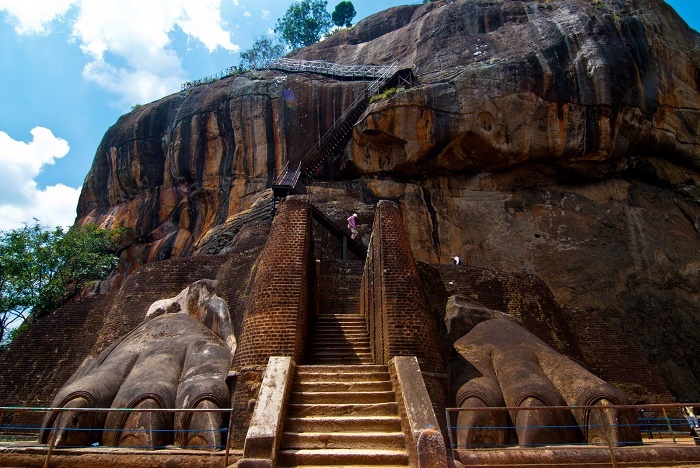 The Cultural Triangle Project, launched by the Government of Sri Lanka, focused its attention on Sigiriya in 1982. Archaeological work began on the entire city for the first time under this project. There was a sculpted lion’s head above the legs and paws flanking the entrance, but the head collapsed years ago. 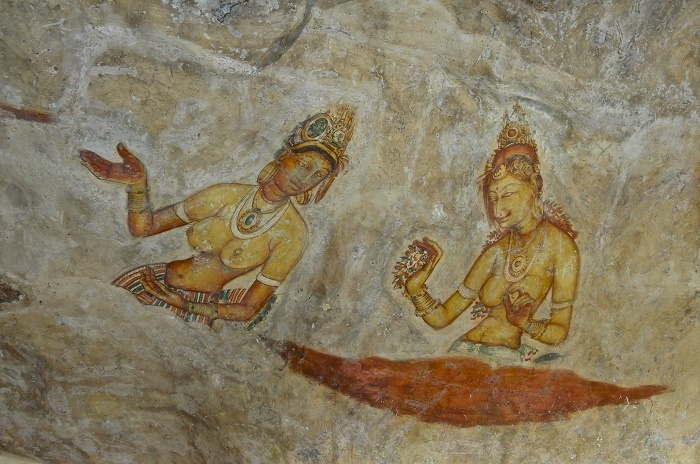 Nowadays, the Sigiriya site contains the ruins of an upper palace located on the flat top of the rock, a mid-level terrace that includes the Lion Gate and the mirror wall with its frescoes, the lower palaces located behind the lavish lower gardens, and moats and ramparts which protected the citadel. Amazing piece of art, rediscovered again.